This 4-night cruise provides a fascinating taster of Assam, with visits to villages and to the Pobitora Wildlife Sanctuary, where you will drive out on safari in search of the Great Indian One Horned Rhinoceros. It is also available as a 3-night one-way cruise up to Pobitora with road transfer onwards to Kaziranga. Day 1.Met at Guwahati airport and embark on ABN Charaidew mid-afternoon close to the great Saraighat Bridge. 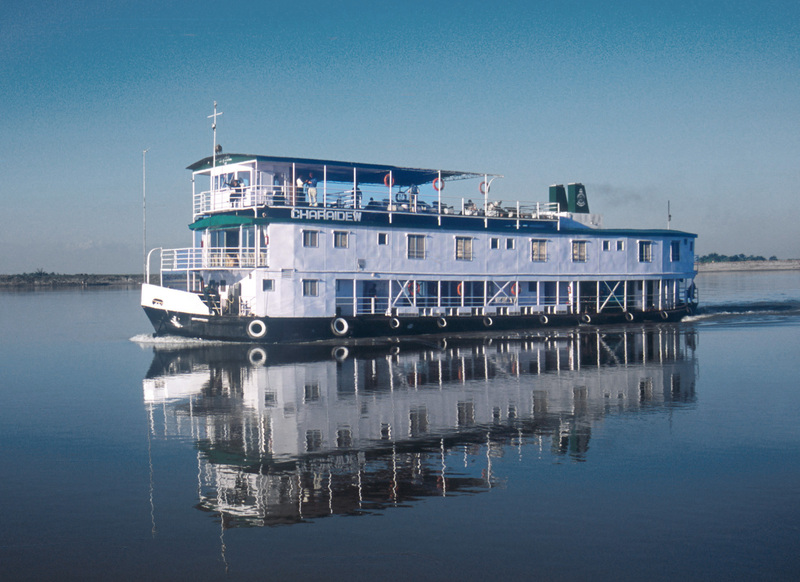 Cruise downstream to an overnight stop close to the south bank village of Viajynagar. Day 2. After breakfast, disembark and explore a riverside village on foot. Cruise upstream to the little town of Sualkuchi, loud with the clatter of looms, and visit on foot its silk weaving workshops. We shall see the whole process of silk manufacture, from cocoon to spinning to dyeing and finally to handweaving into exquisite saris and dress lengths. We then drive on to Hajo, a place sacred to Hindus, Muslims and Buddhists. We visit a hilltop Muslim shrine with far-reaching views over the surrounding rural landscape, as well as the simple Hindu temple with its frieze of elephants and its sacred tank full of great carp, catfish and turtles. Later we reboard and cruise to an overnight mooring near the Saraighat War Memorial. Day 3. Cruising upstream, we disembark at Pandu docks and are taken on a short sightseeing tour of the city of Guwahati. Drive up Nilachal Hill to see the holy Kamakhya temple. With its tantric rites and animal sacrifice, the more squeamish may prefer to content themselves with the exterior. Visit the poignant Commonwealth War Graves cemetery as well as a high-class shop selling local crafts. Cross by country boat to the mid-stream Peacock Island with its population of Golden Langur monkeys before re-embarking and cruising for about an hour and a half upstream to Kurua on the north bank. Day 4. Cruise upstream past jungle-covered hills, and turn into the Mayong River. We cruise up in our country boat for a kilometre or two to the roadhead from where we drive to the Pobitora Wildlife Sanctuary. This small park has a dense population of the Asian One-Horned Rhinoceros, and we shall be unlucky if we do not spot some of these amazing armoured beasts on a jeep safari around the park. Those departing today are picked up from the park and driven c.4 ½ hrs to Kaziranga National Park. Alternatively, returning to the ship in the afternoon we cruise to a riverside village which we explore on foot before sailing down to spend the last night close to the picturesque Aswaklanta Temple on the North bank opposite Guwahati. Day 5. Cruise down to the Saraighat Bridge. Disembark after breakfast and transfer to Guwahati airport for final departure.